Today, we want to wish you all the best! 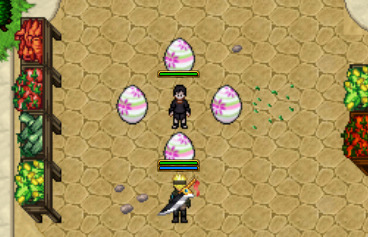 For the time of Easter, npc Kid Sai (near depo and markets) sells Easter eggs that heals 100% for 1 rin each! All bonuses (+10% health, +10% critical chance and damage, +20% loot,+10 levels to skills, +1 exp stage) are active today. * Ultimate transformations added on website. * Information about premium account on website refreshed. * Kuchiyose no Jutsu Kakuzu Heart does not count as a standard summon. * 2x more slots in backpacks, new inner backpack type: large inner backpack (30 slots). * Triple nunchaku changed attack speed training bonus to x26. * Slick dagger changed attack speed training bonus to x16. * Hand weights changed attack speed training bonus to x20. * Enma kongou-nyo changed attack speed training bonus to x48. * Yondaime kunai changed attack speed training bonus to x28. * The support functions have been connected to the game - auto actions. * Favorite weapon for Shino and Shikamaru appears on website. * Shikamaru boost (Kurayami ga Kita) increases throwing by 15, no longer adds taijutsu and blade. * Shino boost (Kikaichuu no Jutsu) increases throwing by 15, no longer adds taijutsu and blade. * Most boosts are now possible to turn on and off. * Scroll boxes are like other boxes now, there's 20% for box to be empty. * There is only one pack of scrolls to learn jutsu, they are always for your character now (based on Choujis scrolls). * Cooldown decreased of Jar of the Sakegari Sword to 1 second. * Sand Golem sprite improved. * Gijyuu Shikyaku no Jutsu effect sprite improved. * Ninken and Adult Ninken cooldowns reduced by 2 seconds. * Choharite increased area damage. * Disable and enable auto actions with !autoactions commands. * Commands !yellowarrow, !redarrow and !turnafterattack connected to !settings commands. 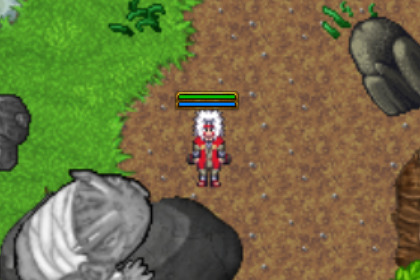 * To Yondaime Robe in NS Shop is included one random skin fitting to the addon. * Genin damage and resistance bonus reduced from 3% to 2%. * Command !removesummons to remove your summons from map. * Shunshin no Jutsu is now possible to turn on and off. * Elite Root Members and Monkeys added to daily tasks from Izumo Kamizuki and Tobi. * Hero/criminal points added as a reward for finished daily tasks. * Teleports changed to Kamui portals. * New house in Konoha: Sarada House, Konoha House #18. 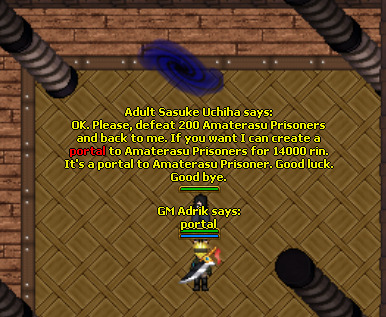 * New daily tasks from Adult Sasuke Uchiha with portals. * Auto walk works on water if you have more than 35 chakra control. * Hawk scroll price went down to 3500 rin from 4000 rin. * Tree chakra control training is twice as fast as it used to be. * New turning to enemy algorithm. * We changed Duel System to Hero vs Criminal System being the basis for new ranks. * A wheel of Fortune added to Lodging Town. * When fighting a player, the maximum attack speed is 4 attacks per second (before it was 10). * Limit level for gaining exp is 1000. * 1# upgrade Kakuzu Heart makes him immortal. * Aggravating bandages changed attack speed training bonus to x8. * Nunchaku changed attack speed training bonus to x20. * Triple nunchaku changed attack speed training bonus to x24. * Slick dagger changed attack speed training bonus to x15. * Hand weights changed attack speed training bonus to x18. * Enma kongou-nyo changed attack speed training bonus to x42. * Yondaime kunai changed attack speed training bonus to x24. * Sharingan fixed during Ultimate Transform. * Way to Gamabunta fixed. * Fixed Kuchiyose no Jutsu Toad.